I know they think this is clever and are probably feeling smug & superior right now but I’m just trying to figure a way to make it work. Hypothetically, you would first have the client create an account and agree to a security deposit, liability waiver and background check. Each rifle would be fitted with redundant RFID chips similar to Toll Tags that would track location around town. 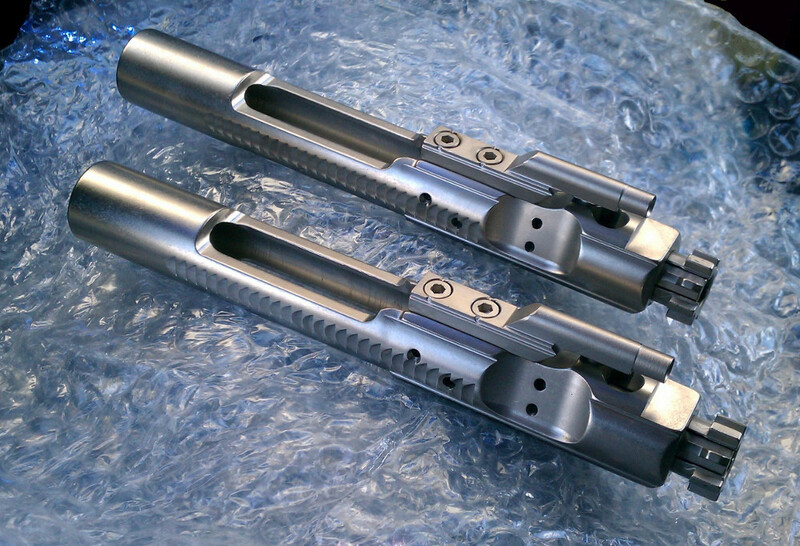 Cost effective CavArms/GWACS lowers would be durable and lower the total amount of parts. Although some components would have to be ‘locked’ to prevent tampering (such as securing the upper and lower receivers together). Magazines could be single use (or return to get a deposit back) and extras sold separately in another vending machine. To rent (or purchase) a client would insert a credit card, place a finger on a scanner for ID and sign on a touch screen. Upon return, employees would check function, run a patch down the barrel and confirm basic zero with a laser boresight prior to it being rented again. The Loudener? Sledge Hammer did it first. Okay then. Putting aside for a moment why someone would want to do that, Sledge Hammer did it first. At least SHM didn’t angle the vents back towards the shooter like Tromix did. Watch the shooter’s hat in this clip and then watch it again to note the amount of burning debris flying back. It strikes me as odd that SHM isn’t marketing it primarily as a muzzle brake, instead choosing to promote the increased noise and concussion. In RECOIL magazine’s online article, Owen of SHM says the ‘demoralizing effect of live fire is important’ and that it is potentially useful to be ‘louder’. Perhaps I’m not Operator enough to understand, but I would think the demoralizing effect of live fire would hinge on an opponent’s understanding of the potential to leak precious vital fluids. Since the claim that the Loudener is increasing muzzle blast and concussion is only accurate when witnessed from the perspective of the shooter [after all, the device does not create any additional energy]. If one accepts that increased noise is ‘demoralizing’, I have to wonder why someone would use this to demoralize themselves and/or their own team. …successfully bathe a cat without bleeding. 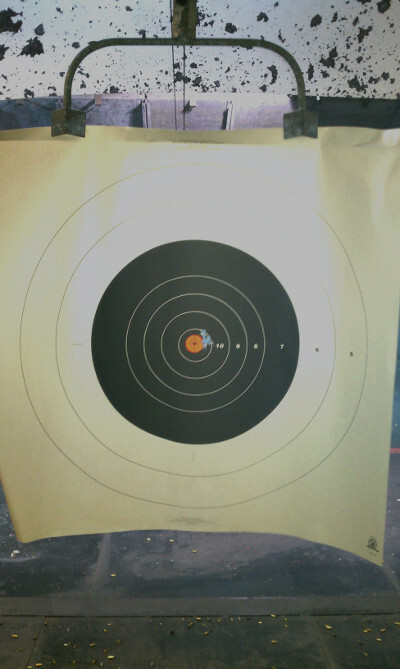 The orange spot is a 1 1/2″ target spot with the group being about the width of my thumb with slight vertical stringing. I’m pretty sure the stringing is my fault as I adjusted my grip while shooting this group; the fact that it is off center I attribute to the rear sight placement. In order to change out the factory sear block for the Apex one, the rear sight must be moved out of the way*. Obviously I did not restore it to the exact same spot. Now where did I put my caliper? As for the trigger, I’m still very happy. Of note is that I originally reported the pull weight at 4 lbs 10 oz, but using the Lyman digital trigger pull scale borrowed from a range employee I measured it again at 5 lbs even. I’m not sure which scale is more accurate but I am careful to keep my technique consistent. Out of curiosity, I will swap the carry weight trigger spring for the competition weight spring before my next range trip to see how much difference it makes in pull weight and subjective feel. Either way the trigger feel is fantastic and my personal metric of ‘do I shoot it better after the mod?’ tells me that this was definitely a worthwhile upgrade and it made the M&P’s easier for me to shoot accurately. FTC notice: TANSTAAFL. I bought it. Bugg3r off. As mentioned Friday, I had the privilege of introducing another person to the joy of responsible firearms use this past weekend. The old saying that you never get a second chance at a first impression holds true and I try to stack the odds in favor of a positive experience when bringing in new shooters. Things like using ear plugs and electronic muffs for indoor shooting, larger high contrast ‘positive feedback’ targets, shorter distances and light recoiling, accurate firearms (.22 rimfire) all make the experience easier. I assume up front that I will cover all the costs associated. [Hey, the first one’s free. *wink*] I also try to avoid crowds (unable to do that this time), using unfamiliar jargon, overly technical details, politics, and targets that represent other people or animals. My goal is simply to introduce my hobby to the person. Afterwards, if they want more info, I can always elaborate. We met at a local indoor range on Saturday afternoon and it was packed! While we waited for a lane, I covered Cooper’s rules of safety and the basics of grip, stance and sight alignment. Thankfully, a range employee found a quiet area for us to use during the instruction. Trying to explain anything on a live range even with electronic hearing protection is, um, difficult. The dreaded flinch is something we all have to overcome; preventing it in the first place is something to strive for. Public ranges present more of a challenge with new shooters due to the noise from the other patrons. Some of the benefits of using a rimfire are lost when the guy in the next lane is firing a .40 S&W, .357 mag, shotgun, etc. When timing allows, I prefer to instruct new shooters using a pellet gun in the backyard before going to a gun range or better yet out to the country. My student was a quick study and quickly understood the safety and sight alignment concepts; grip, stance and trigger press were, of course, unfamiliar and required a bit more explanation. However, once we had the chance to shoot, he took to it like a duck to water. Starting at about 5 yards, my student put the first 10 rounds into about a 5 inch group using my Ruger 22/45 with a fiber optic front sight. Pretty good for a first go! We worked a bit on grip and trigger press for another magazine or two and soon moved a fresh target out to 7 yards in order to force more focus onto the front sight. He did very well again and kept the group at about the same size or smaller at that distance. After a hundred rounds or so of .22, I asked if he’d like to try something else. He gladly accepted the chance to shoot a few rounds of 9mm* and .38 special. Again he shot well and enjoyed every moment of it. We finished up with a magazine or two of .22 to reinforce good habits and called it a day. As we were leaving he asked if he could reimburse me for the expense. I thanked him for offering but declined stating that I found it rewarding that he had a good time and that was enough. When he pressed a bit, I responded that if he really wanted to, the best remuneration he could give me would be to join the NRA**. He responded with a half-joking, “Well, I don’t want to be on any lists.” Smiling, I half-joked back saying, “I don’t understand. You’re already on the lists.” [He has a job requiring federal security clearance and at least two hobbies requiring federal licenses.] He agreed to consider it. We talked a bit more and parted as friends, agreeing we both want more range time. **Yes, I did say I try to avoid politics with new shooters but I also want to keep being able to exercise my rights and enjoy my favorite past time. Remember: If each member just brought in one more, the membership would double. I have to say that after having read one particular account of R-Guns customer service I was concerned, but here they are without a hitch. I ordered them in February and they didn’t charge my card until the day they shipped via UPS. Sometime this weekend I will have the honor of introducing another soul (a bonafide NASA engineer, no less) to the joys of shooting. All I had to do was offer and he accepted saying that he’s been interested in learning about firearms for a long time but hasn’t had someone to introduce him to the sport. So, who have you offered to take to the range lately?